I'm rather fond of this statue. It’s Oberon Zell’s version of a Millennial Gaia. I’ve got one that I use often, I’m sure you can find it all over the ‘net. 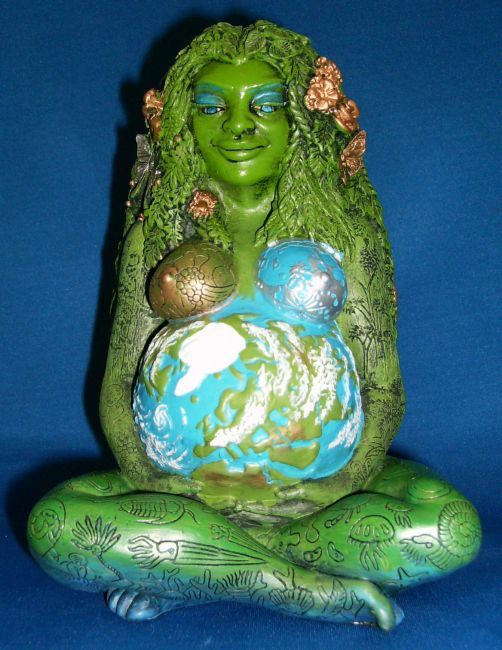 When I hear someone talking of “protecting Mother Gaia,” this isn’t the image that pops into my head. That image is of a fragile porcelain statue carefully preserved in a glass case. Someone who would bruise if you looked at her the wrong way. Someone who always needs a Protector, a Champion. Someone who is a walking tragedy. Gods help us, that’s the victimhood mindset again. Carefully enshrined in a godmask designed to prey on your guilt. Lady goddesses Gods tend to be lusty lasses. Yes, even the virgin ones. They aren’t waiting around to be rescued. They don’t need protection. Respect, yes, but not protection. They are Powers. They are Divine. They are strong. This whole thing about the Earth being a frail maiden has got to go. Let’s start with something simple. No goddesses, just female and male gods. The lady gods aren’t an extension of male gods, they are gods. Period. Look at the stories. When needed, female gods were more fierce than the males. They fought beside, they didn’t huddle in the great hall waiting for news. And outside of battle, who do you think could match the lust and strength of a thundering sky-god? It wasn’t some flimsy girl-child shielded from harm. Face the facts. If Gaia doesn’t want humans, there won’t be humans anymore. The planet is four billion years old. Humanity’s last ten thousand years is less than an eyeblink. Respect, yes. Honor, yes. Study, yes. Protect and defend? She can do it Herself. She’s done it long before you drew breath and She’ll do long after your great great great grandchildren have dissolved into dust. There’s very little here that didn’t come from the Earth in the first place. Humans need Earth much more than Earth needs humans. Don’t pretend to know what’s best. Just learn what She’s already saying.